Downsizing can be a tough decision, particularly given memories associated with a family home, but there are benefits to be had from a move to a smaller property. an opportunity to move into a property that is easier to manage, making it easier to maintain independent living. a chance to move to a more favourable location, perhaps nearer to family and friends. a potential way to raise money by moving to a less expensive property, perhaps also with lower energy bills and maintenance costs. There could be several reasons why you may be considering moving in later life, these could include, moving to a new place or to be closer to family. Or a recent change in circumstance such as a bereavement or health issue has made you consider your living arrangements. 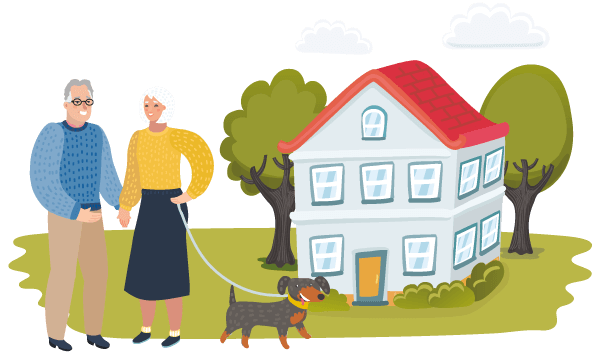 Even a slight change in health and mobility can affect day to day lives and being able to move around or in/ out of your home easily will help you stay independent for longer. You may be considering downsizing for financial gain? Retired homeowners are often asset rich and cash poor, living on small pensions and incomes. Downsizing to a less expensive property can be a way to raise money to fund living, holidays, new car or help family members with finances. Top 10 reasons why you should consider downsizing and renting a retirement property with Girlings. Smaller homes or fewer rooms may reduce your carbon footprint but will also reduce your outgoings – lower heating/electricity bills, water charges and council tax! The cost of fixing things that go wrong in the home is a big worry and many of us don’t want to spend precious time doing DIY. A smaller property may reduce maintenance worries & costs. Many of our residents living in our retirement rental properties tell us they love the fact they don’t have to worry about maintenance as it’s all included in their monthly rent. Physical chores can become more difficult to complete as we get older, downsizing may reduce house work, creating free time for leisure and spending time with family! Selling a home enables the release of capital for investment or spending. It can help you fund retirement living, be used to help family members with their finances or be spent on holidays and travelling. As people age, they often need a property more appropriate for their physical needs. Most retirement developments have lifts, so you won’t have to struggle with stairs. For extra peace of mind there is usually an on-site manager available on weekdays and 24-hour emergency assistance too. A rental property for life! 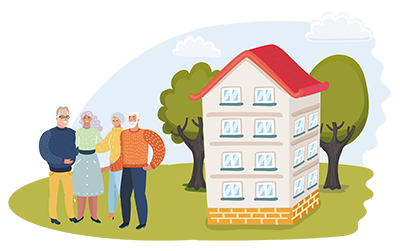 Many retirees don’t realise they can downsize and rent on assured ‘lifetime’ tenancies, allowing them to remain in their properties for as long as they wish. For most people, assured tenancies are the biggest attraction of renting in retirement with Girlings. Downsizing and moving to a new area in retirement can give people a new lease of life. Many people dream of living by the sea, whilst others prefer the convenience of city centre living – we have options for everyone. Many of our residents enjoy the fact they can travel abroad or in the UK and simply lock up and leave their apartment, safe in the knowledge their homes are totally secure and that a development manager is on site to check everything is OK. Living in a large home can feel very lonely and empty at times, by moving to a retirement development you can join social events from coffee mornings to fish & chip suppers. The communal lounge & gardens also provide many opportunities for residents to meet and socialise. The landlord and managing agent is responsible for any service charges & property maintenance, including the upkeep & cleaning of common areas, the upkeep of the external areas, including gardens, external window cleaning; lift maintenance; insurance of the building and in many cases the cost of water is also included. This helps you to budget your money each month without any big surprises.